A Simple Jew: Guest Posting By Rabbi Shlomo Slatkin - What Time Do Chassidim Daven Shavuos Morning? Guest Posting By Rabbi Shlomo Slatkin - What Time Do Chassidim Daven Shavuos Morning? There is a minhag among many Chassidim to sleep for a few hours after going to the mikveh Shavuos morning and then daven Shacharis at the regular time, not netz. The Sefer Mishmeres Shalom by R' Shalom of Koidenov/Brahin, who was the son of R' Boruch Mordechai of Koidenov and brother of R' Aharon Koidenover, explains this minhag as it was the minhag of his fathers. (Mishmeres Shalom provides halachic basis for many Chassidic minhagim and has haskamos of R' Chaim Brisker and the Aruch haShulchan. Siach Avos, the publication society of Koidenov, is currently in the process of reproducing the sefer, replete with about 1,000 he’aros. I have seen the work and it is a must have for anyone interested in Chassidishe minhagim) In Siman 39:3 he says that there are those who don’t sleep at all Shavuos night and daven b’hashkama but that the minhag of his fathers was not that. 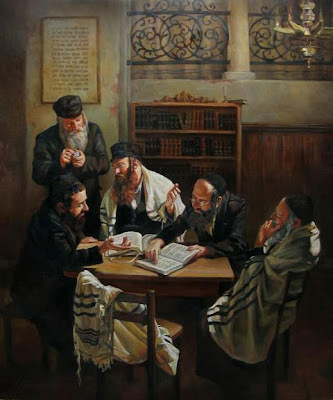 Rather they went to the mikveh after the tikun and then they would sleep a bit and would daven at the time they were regularly accustomed to on Shabbos and Yom Tov. He proceeds to give a few reasons for this minhag. The first is that one must daven with a daas tzlula, with a clear head. This can be found in the siddur of his great uncle, R' Yaakov Emden where he writes that it is better for one to sleep a bit if he doesn’t think he will be able to daven after staying up all night learning. There is a support for this (smach ktzas) in that by Matan Torah we were also sleeping. If in those generations they slept, kal v’chomer for our weak generation that it should be ok. I found this proof to be troubling as the simple reason we stay up all night according to the Magen Avraham is that it is to rectify the fact that we were sleeping at Matan Torah. Instead of Moshe having to wake us up, we stay up. Of course, by the time we hit layning most people are half asleep so it kind of defeats the purpose. Regardless of this support, the general idea of being able to daven Shavuos morning with a clear head is very compelling. I have spoken multiple times over the years about this inyan with the Koidenover Rebbe and he said that your mouth might be working but your mind isn’t after staying up all night. He also said it is better to sleep in order to daven than daven in order to sleep. This is akin to the maaseh from the Stoliner (which I have not been able to locate) about eating before davening. I found an interesting statement from R' Asher Stoliner about sleeping in general (Divrei Aharon 11). He says that a person who doesn’t sleep sufficiently is like a threshold that is being walked upon under the feet of the yetzer hara. Even a tzadik can’t accomplish anything. He says that even before Kabbalas haTorah it says “vayotziem Moshe ltachtis hahar” that they were sleeping before Kabbalas haTorah. And this was in order that their mind would be refined and clear for Kabbalas haTorah. The Mishmeres Shalom cites another reason that it is an Ais Ratzon to daven when the tzibor davens and therefore it is better to daven when everyone davens. Along those lines one should daven b’agudah achas in the spirit of vayichan Yisroel and not make multiple minyanim as it is not kvod Yom Tov. There is also the shailah of birkas haTorah for one who stays up all night and one does not want to put oneself in such a safek on Matan Torah. He also mentions that there are reasons that cannot be written and therefore all of the tzadikim are noheg this minhag. If your shul only has a netz minyan on Shavuos morning then this second reason may not apply as you are not making an extra minyan. I would be interested to hear what other people do in terms of this minhag. Although it appears sleeping would be a hefsek to the avodah of Shavuos night, if one doesn’t sleep it is very often yotseh scharo b’hefsedo. This past Shavuos I did sleep and found a 9:00 minyan at another shul. While I did miss being with the tzibor I usually daven with, I was able to have a better, more awake davening. I had my Yom Tov Seudah, had a normal Shabbos/Yom Tov nap and had a semblance of a real Yom Tov day. It also worked out better for my family as the kids didn’t have to worry about waking me up if I were sleeping from 7:30am and on. If you are in Baltimore for Shavuos I am giving a shiur on this topic so it will go into more detail. I would be interested to hear if there are any tzadikim that were makpid to daven netz. (I know the Komarana talks about it and used to do it but stopped). Baal Shem Tov's minhog was to daven kevasikin on Shavuos. So it's the Breslover minhog as well because of that. Regarding the need to daven with a daas tzlula, this is definitely important, but it can't be universal for different people. For example I feel completely broken, if I don't sleep a whole night, and afterward have a few hours sleep and have to wake up, instead of full length sleep. So in such case there is more daas tzlula if I daven right away without going to sleep. There is also the shailah of birkas haTorah for one who stays up all night and one does not want to put oneself in such a safek on Matan Torah. Lemayse - one can say it if even if one didn't sleep whole night. Only "Al netilas yodoim" and "Eloykay neshomo" should be skipped. Thanks for all your comments. Is there a source you can point to where the Baal Shem Tov's minhag is detailed? Also, there is a machlokes rishonim as to whether one can say birkas haTorah if one doesn't sleep so the Mishmeres Shalom is saying that of all days one should not want to put oneself into a possibly questionable case of whether there is a chiuv for the bracha. Many poskim say that it is better to hear it from someone else. Even if l'maaseh one holds that one can make birkas haTorah, as do many poskim, it is still a contentious issue. Shvii Shel Peysach, Shavuos, Tisho beOv, Hoyshano Rabo and Purim. This is an oral mesoyro in Breslov, briefly mentioned in Yemey Moharna"th. May be there are other documented sources, but I'm not sure. The Lubavitcher Rebbe wrote that it is preferable to sleep first in order to be able to daven with concentration. There is a story with the Tzemach Tzedek where he tells his daughter: "better eat in order to daven, than daven in order to eat." That story is printed in Hayom Yom and the sichos of R' Y. Y. of Lubavitch and is thus verifiable.